With its compact dimensions, the bernette Chicago takes up less storage space in the home—good news for households where space is at a premium. Its handy size also makes it a popular companion on your travels to workshops and classes. The freearm with built-in slide-on table provides a practical storage space for keeping the various presser feet and other accessories close at hand. The flip-top lid not only protects against dust, but has a summary of all stitches and stitch patterns on its inside for quick selection. 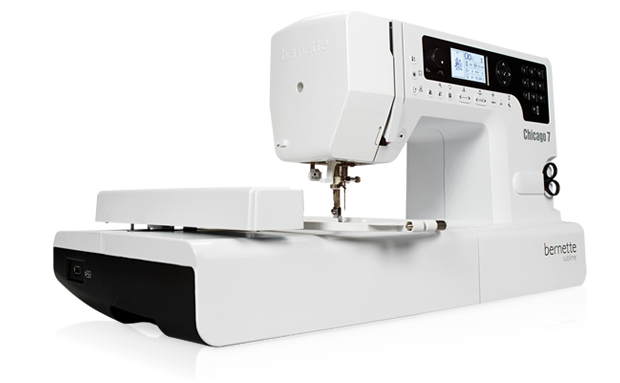 An LED system provides bright illumination of the sewing area around the needle, and the built-in scissors at the front are ready to use anytime while sewing. By removing the slide-on table, the embroidery module, which has a maximum embroidery area of 110 x 170 mm, can be attached quickly and easily. Use the 100 exclusive pre-programmed embroidery designs and enjoy the fine, precise embroidery quality of the bernette Chicago. The needle thread monitor automatically stops the embroidery process if the needle thread breaks or the spool is empty. The bobbin is also checked before each embroidery operation. This guarantees reliable embroidery.